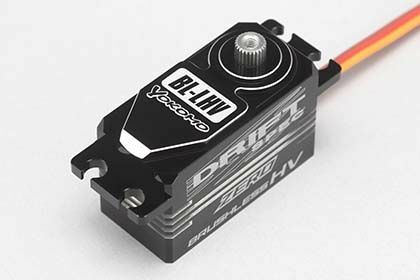 A high-end brushless servo for drift is newly introduced Laser engraving aluminum case with high heat dissipation into a dedicated design to enhance the atmosphere of drift. Of course, it is a high spec that fully supports high-load drift running as performance, brushless driving motor which is the essential part of steering servo, improved both function and durability at the same time. Then, the internal gear that transmits the drive, and the final gear are all made of the full Titan, and even though it is super lightweight, the wear of the gear is also prevented, and the basic performance of the motor is told without exceeding it. The case that holds the gear inside is unexpectedly made with ultra-high precision full ali, the gear meshing precision is outstanding. Heat sink effect which is characteristic of aluminum enhances heat dissipation.